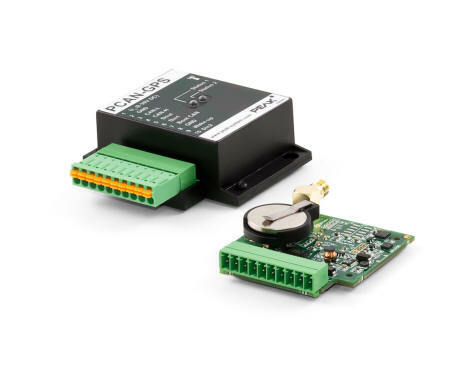 This page describes our Programmable CAN Controllers - we have a number of units that require the user to program the modules in C. This gives much more control and flexibility but requires a greater investment in time to program the unit. A GCC Compiler, GDB development environment and sample programs are supplied to cover the most basic functions and get you started. It's a rather artificial separation but on the Peak Configurable Data Acquisition page we show systems that are configured via simple PC based Windows Applications. The advantage of this configuration process is that no programming expertise is required and configurations may be rapidly created and changed. They all need a PEAK-CAN interface for the initial loading of fresh configurations but after that can of course be read and written to by any valid CAN interface. 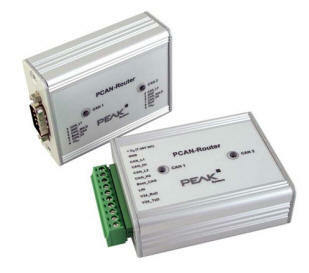 The PCAN-Router is a module that accesses two separate CAN networks. It uses a programmable ARM microcontroller to process the data it sees on these two channels , so that incoming CAN messages can be evaluated, converted, and filtered individually, in order to transmit appropriately customized CAN messages to the other network. The PCAN-Router is shipped with demonstration firmware which performs one-to-one forwarding of the CAN messages between the two CAN networks at 500 kbit/s. The source code for this application is included on the CD-ROM supplied with the units. It is possible to load your own firmware onto the module via CAN by means of a pre installed boot loader. The module is mounted in an aluminium casing, and is shipped in versions with two Sub-D connectors, or a screw-terminal strip. A power supply 7-26V DC is required. The router can be fitted with an additional LIN channel if required. 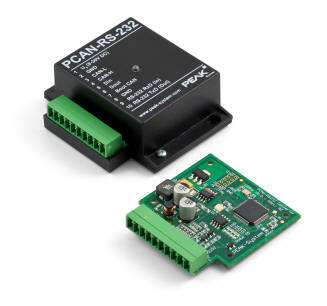 PCAN-RS-232 is a programmable module for putting an RS-232 device (Printer or perhaps an old design of A/D converter) onto a CAN network. The work of of formatting the data to be sent to or taken from the CAN messages is done via a NXP LPC21 series microcontroller. Using the supplied library and the Yagarto GNU ARM toolchain (contains the GNU Compiler Collection GCC for C and C++), custom firmware can be created and then transferred to the module. This gives a whole range of options for formatting, manipulation, evaluation, filtering, and routing of the data traffic. On delivery the PCAN-RS-232 is provided with demo firmware that routes from CAN to RS-232 and vice versa. It allows the configuration of the data to be transfered as well as the hardware serial control commands. The corresponding source code is included as an example. A GPS, compass, accelerometer, and gyroscope all included in a single module that may be interrogated by the CAN bus. It has a satellite receiver, a magnetic field sensor, an accelerometer, and a gyroscope. The sampled data can be transmitted on the CAN bus and logged on the internal memory card. The data processing is performed by a NXP LPC4000 microcontroller. Using the supplied library and the Yagarto GNU ARM toolchain (contains the GNU Compiler Collection, GCC for C and C++), custom firmware can be created and then transferred to the module. This gives a whole range of options for manipulation, evaluation, filtering, and routing of the data traffic. On delivery, the PCAN-GPS is provided with demo firmware that transmits the raw data of the sensors periodically on the CAN bus. The source code of the demo firmware as well as further programming examples are included. 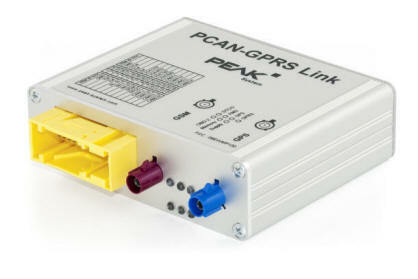 The PCAN-GPRS Link is a development platform for telematic applications. An API allows simple integration of functions within a specific application environment. 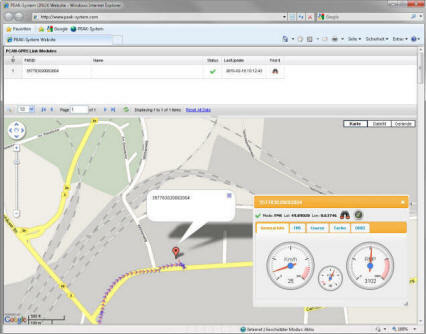 The PCAN-GPRS Link supports the evaluation of FMS and Bus FMS data (Fleet Management System) for which it produces consumption related vehicle data. There are two programmable microcontrollers within the unit which process internal vehicle data and run the GPRS. The DTCO info interface also allows the connection and processing of a digital tacho with access to information such as driver identification and driver working time. The GPS module can be used to determine location and output the direction of travel. There is an optional expansion to allow additional data to be processed, output and recorded. These include temperature and movement sensors, barcode scanners, RFID readers, displays, and WiFi or Bluetooth connections. * Use of Google Maps is subject to the licensing terms and conditions as specified by Google Inc. and is only free of charge within limits. Two High-speed CAN channels (ISO 11898-2) with bit rates of 40 kbit/s to 1 Mbit/s.